Ignore your slide count and focus on your story. The actual slide count is not what your boss is trying to limit. Instead he or she is looking for two things: a simpler story and a faster meeting. Rather than clipping slides, your boss wants you to simplify and synthesize the information into a coherent narrative. Leave out the nitty gritty data and tell the bigger story. Shorten up your talking points to the most important information so that your audience will be sure to get the point. Stuffing three slides worth of content onto one slide will over-complicate your presentation and overwhelm your audience. Your point will be lost in a confusing pile of information that your audience will need to parse themselves. Instead distill your information into a coherent story. What is the main argument or point to this information? Stick with high-level info and keep the proof in your back pocket in case they ask for more. Cramming information onto slides will also extend your talking time. You’ll simply have to spend triple the amount of time explaining one slide, rather than giving a more holistic picture. Even in short presentations, it can be helpful to include title and way-finder slides like section break or “summary point” slides. These simple slides will be on the screen for only a few seconds, but they will help your audience stay oriented in your narrative and information while driving home your most important points. 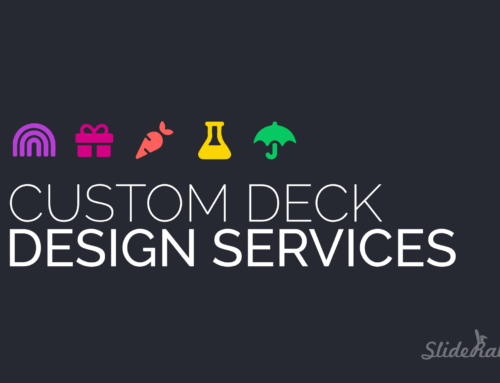 Have a deck you need to shorten? Whether it’s design or content sculpting you’re after, we would love to provide you with some custom PowerPoint help. Send us a quick note to get rolling!